Cherry, hickory, and apple wood chips help give your grill spread that smoky flavor we all love. How do you win big at the BBQ game? Put all your chips on the table— or in this case, the grill. 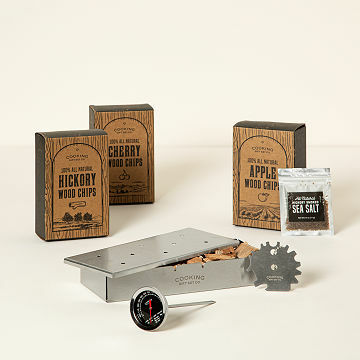 Give veggies, grillable cheeses, even fruit that smoky flavor we all love with this wood chip trio. Fill the included smoker box with all-natural cherry, hickory, and/or apple chips, place it on the grill with your food, and cover to give them some privacy. Also included: a thermometer so you'll know when it's time, and hickory-smoked sea salt for a finishing touch. Made in California. Like that it's portable and easy to use. My husband uses them all the time as he does the grilling. My husband is the avid griller. He was really excited about trying to smoke a brisket for our friends and he could not have been happier to rec' this gift in time for the party prep. We tried the apple smoke flavor first and it was a hit. Perfect for my Dad's Birthday! Its so hard to shop for my Dad, he's got everything already and I didn't want to get him another gift that would be adding to the junk pile. When I saw this, it was perfect. He loves to cook and grill already, but he's never tried smoking on the grill before. And with the summer starting, it was a great new experience that we did together.